Give your iPad or a similar tablet more flexibility. Just snap it into the cradle to free your hands: use a Bluetooth keyboard for intensive computing; position your tablet within your digital workflow by locating it alongside your main workstation monitor; move the screen where you can easily reference instructions or recipes. Turn, rotate, extend or retract your tablet with just a touch; push the arm's side button to raise or lower it through an 8" height range. Place your tablet exactly where you want it. Works with many tablets and eReaders, including Apple iPad, Barnes & Noble Nook and Amazon Kindle. Easily remove the tablet from the cradle when you need to go mobile. The cradle's adjustable contact points keep ports free. Sliding brackets allow adjustment to a variety of tablet sizes, with or without case. The cradle firmly grasps tablet with latch for secure placement. The arm's sturdy design maintains touch-screen stability. View tablet in portrait or landscape mode; easily rotate from one mode to the other. Arm can extend the tablet out up to 19.3" to the point of need. Robust construction dampens shock and vibration. 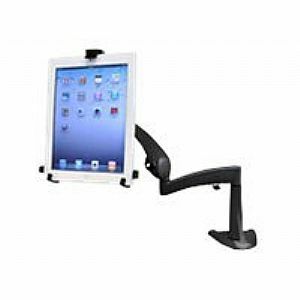 Can be used to hold an LCD monitor when the tablet cradle is removed. For Monitors (Size, Weight): Up to 10", up to 2.5 lbs.